The Third Teacher+ studio is excited to welcome David Jakes to the team. Starting in July, he’ll serve as a Digital Strategist and Designer for TTT+ and help develop new projects within Cannon Design's K-12 practice in Chicago and throughout the Midwest. David has spent the last three decades in education as a teacher, technologist, storyteller, and designer. Most recently, he has overseen all technology and library services as the Coordinator of Instructional Technology and Information Services at Glenbrook South High School in Glenview, IL, 20 miles northwest of Chicago. 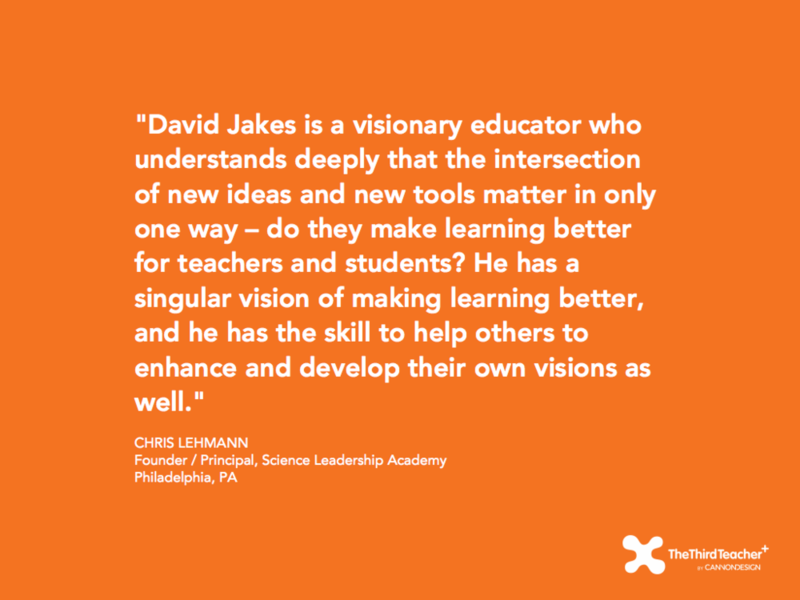 David is recognized as a thought leader in the educational technology field on a variety of topics, including digital storytelling, cloud-based learning environments and their relationship to physical learning spaces, mobile learning, professional development, and the use and impact of social media in education. He currently maintains an extensive set of web resources dedicated to improving the use of technology in education: a web site (Jakesonline.org), a blog (DavidJakes.me), and a variety of other resources (David Jakes Presentation Resources). David is also a frequent speaker at national and international educational technology conferences. He received his bachelors in fisheries management from the University of Wisconsin-Stevens Point, and a masters in the same discipline from the University of Georgia. He then worked for the U.S. Fish and Wildlife Service as a river biologist before spending 15 years as a HS biology teacher and another 12 focused on instructional technology. "For me, design provides a landscape for innovation, a way to think and rethink what education is and can be, while focusing deeply on the needs of students and their learning."